Research shows that costs are the strongest predictor of future returns. Movement charges a flat fee, uses low-cost ETFs, and maximizes tax efficiency. Your portfolio should be globally diversified, protected from inflation, and able to reduce equity exposure when there’s a high probability of recession. An investment strategy should make sense. Simple portfolios are easier to maintain and more likely to stand the test of time than complex solutions. Both earn 7% per year. 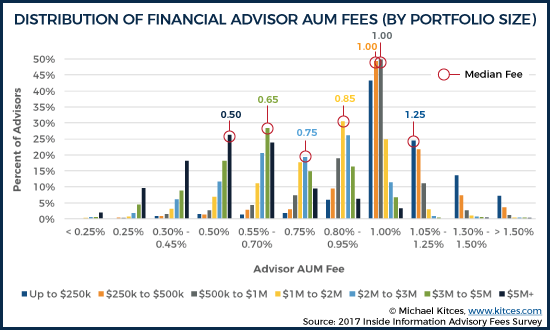 One investor pays an advisor 0.85% per year (the industry median for an account of this size). The other investor pays an advisor a flat $3,500 per year. The flat-fee client saved $585,000 over 30 years. In addition to flat fees, Movement only uses the lowest-cost investment funds. The average expense ratio for funds that advisors use is 0.50%. The average expense ratio for funds that Movement uses is 0.07%. For the example above, that would mean an additional $100,000 in savings over 30 years. Movement Capital uses ETFs in client accounts because they are more tax efficient than mutual funds. Imagine two investors: one invests in a mutual fund that realizes 10% in capital gains, while the other invests in an ETF that pursues the same strategy. At the end of the year, the mutual fund will probably be forced to distribute the capital gain to the investor. The ETF likely lowered the investor’s tax liability through the creation/redemption mechanism. Less taxes and fees translate to higher returns. Humans are reliably unreliable. We sometimes have a fight or flight reaction to obstacles or hard decisions, but this does not work in investing. A smarter solution is to defer investing decisions to data-driven models. There is abundant research that shows financial forecasters consistently fail to predict market moves. In 2007, Wall Street’s top strategists estimated that the S&P 500 would finish 2008 at 1640. It closed the year at 903, leaving the forecasters 45% off the mark. In a variety of fields, researchers have compared simple models against the forecasting ability of industry experts, with studies ranging from assessing wine quality to estimating the probability of business success. Across 136 academic studies, simple models beat or matched the forecasting abilities of experts 94% of the time. Models reliably outperform experts because they are not prone to behavioral biases, and this is why systematic models drive all Movement Capital portfolios. Momentum models have historically reduced risk when compared to traditional buy and hold strategies. The graph below shows a momentum model’s reduction in peak to trough drawdown of both U.S. and international stocks. An in-depth explanation of this approach is provided on the model page. A shipbuilder does not construct a ship for calm seas – they know that storms occasionally happen and build accordingly. Investment portfolios need to be constructed in a similar manner: positioned for the best but prepared for the worst. Data shows that most stock market gains come from a small number of big winners, and the chances of picking these winners in advance are slim to none. Investors can increase their probability of long-term success by investing in diversified funds, not individual stocks and bonds. Diversification can be a frustrating strategy in the short run, since you will lag behind the top performing asset in a given year. However, a diversified strategy provides a higher probability of long-term success. There are two broad types of investments: stocks and bonds. Stocks represent ownership in a company, and a stock’s value comes from its future cash flows. Bonds represent money lent to a government or corporation for a fixed amount of time in exchange for regular interest payments. Simply put, stock investors are owners and bond investors are loaners. Over the long term, stocks have historically outperformed bonds and cash. However, you must take on a significant amount of risk to capture long-term stock returns. Would you worry if you invested $1,000,000 and lost $500,000 the next year? Most people would, and this is why they should not pursue an investment strategy focused exclusively on stocks. Stock and bond allocations are a careful balance of an investor’s time horizon and personal feelings about risk. Take two years of hypothetical investment returns, where one year saw a gain of 50% and the next saw a loss of 50%. The average return is 0%, but the investor’s return is far different – $100 would grow to $150 after a 50% gain, but would then fall to $75 after a 50% loss. This equals a compound return of negative 25%. The difference between average and compound returns is called the “volatility tax”. If you lose 10%, it takes 11% to get back to even. If you lose 25%, it takes 33%. There is an asymmetric relationship between the losses and gains necessary to get back to even. Consider two hypothetical investments shown in the table below. One has an average return of 4.7% and the other 4.4%. Most people would initially guess the first option returned more money, but that’s not the case. A less volatile return path, despite having a lower average return, results in higher total compound returns. The average U.S. investor has 79% of their stock exposure in U.S. stocks. People tend to invest more in their own local markets because it’s the comfortable thing to do. This is called home country bias. Staying close to home and ignoring the rest of the world is the wrong decision to make in today’s globalized markets. Between 1899 and 2017, the value of U.K. stocks (the world’s biggest economy in 1899) dropped from 25% of the global stock market to just 6%. U.S. investors shouldn’t look in the rear-view mirror and concentrate in the U.S. because it was the right thing to do decades ago. They should look forward, acknowledge that no one knows what the future will hold, and globally diversify their portfolios. Imagine that you bought a 10-year U.S. Treasury bond in 1968 that paid 5% a year in interest. Inflation at the time was around 3%, so you were making 2% after inflation. During the 1970s, that bond actually lost money, since you continued to receive 5% in interest but inflation rose to over 13%. Traditional stocks and bond portfolios struggled in the inflationary 1970s, and they are just as vulnerable now as they were then. This is why Movement Capital uses inflation-linked bonds and local currency international stocks to protect clients against inflation. Interested in the exact models behind Movement’s portfolios?